Stronghold Blue for cats prevents fleas, heartworm, ear mites, hookworm and roundworm. This powerful topical boasts a variety of usages, and requires very little effort on your part to keep your cat at a healthy level of frisky curiosity, or apathetic lethargy. It just depends on that testy tabby’s mood. Wait at least 2 hours after treatment to bathe your cat. Is this product Revolution just with a different name? Yes, it is the same product branded as Stronghold. How long after application is used does it take for fleas to die? You may occasionally see a few fleas on dogs or cats treated with Stronghold but more than 98% of adult fleas are killed within 36 hours. What is different between stronghold blue and stronghold plus? Stronghold Plus covers ticks top of the other parasites. I was wondering if i have an open tube but wasn't able to use it on my cat/dog is it safe to store it in a ziplock plastic bag for the next month to give...?or will it go bad? and if so for how long can you keep a tube open with its cap on? We do not recommend storing opened tubes for a later use. Unfortunately there is not enough information about this type of usage as each tube is for a single application. Living in Florida, fleas and other parasites can be present year 'round. We have a cat with a flea allergy, and Stronghold keeps her flea free and comfortable, it's easy to apply, and most importantly for our family, it's affordable, as we have 6 rescue cats. Simpy stated, Stronghold works! Very happy with Stronghold. We are a multicat household & also foster other cats. Stronghold is extremely effective for fleas, earmites, & other parasites. It's also one of the safest products out there. The vet that I work for highly recomnends it to many of our clients. 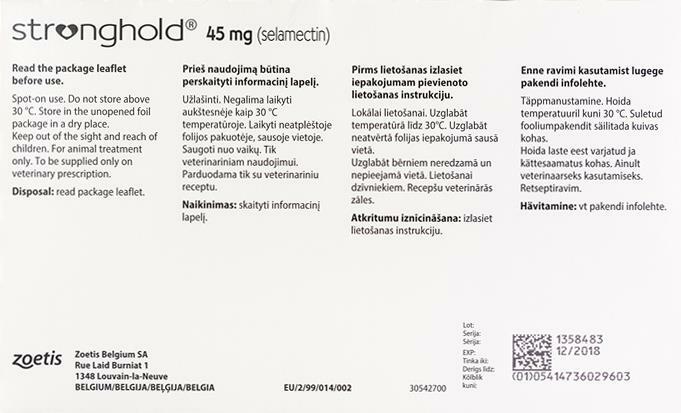 Stronghold is just perfect for my cats who are spoiled and don´t want to swallow pills in any shape, not even when you mic it with meat or put it in melted cheese. It is very easy to put on cats, it protects them for a month and the price is ok. in my country you can buy it only on a recepie and not in all towns, so I am happy that you exist. Thank you. Finally, I've found a product, Stronghold, that doesn't make my cat sluggish or her hair fall out at the application site. For the first time in a long time, she plays with toys, chases her tail, and seems happy. The product covers my cats as described. None of them have been infected by anything since I started using it. I will continue use it due to how effective and reasonably priced it is.